So… my son is gone. Has been gone for a couple weeks now, actually. This was a portion of his growing up and moving out to begin his own life apart from all he has ever known. And good for him. That’s what we raised him to do: be a responsible, self-sufficient individual. On the other hand, there are varying levels of sadness (grief?) for me. I really never thought that getting to this stage in life would show up as quickly as it did. I mean, it seems like we spent a lot of time trying to get to a point of financial means to accumulate the stuff we needed to make life run easier. Things like hedge trimmers, and a 100 ft. hose to reach the garden. Shovels and rakes that didn’t bend and break upon the first use. Storage boxes for Legos and Christmas ornaments. Tupperware. A roasting pan for the ham on Easter morning. An extra set or two of sheets in case we had company or someone had the flu bug. Furniture with drawers to store envelopes and tax returns and computer cords. Suitcases instead of gym bags. Wax and Rain-X in the garage to keep the cars clean. Not necessarily the unnecessary stuff we also acquired over the years like DVD’s or a panini press or an xBox battery charger, but the things that really and truly meant we were able to function without being thrown into a panic that we couldn’t afford it until the next paycheck or then some. So while we were busy gathering the stuff of life, and our kids were busy growing up, I never gave much thought that one day, I’d be one of those people who always talked about downsizing or giving things away. I especially never imagined I’d be the woman helping in the nursery admonishing the young mothers to enjoy time with their babies while they can, because your children really do grow up in the blink of an eye. With two gone, the last with one foot out the door and a husband who still travels a great deal for work, I find I have too much house. Too many things. In some ways, too much time. 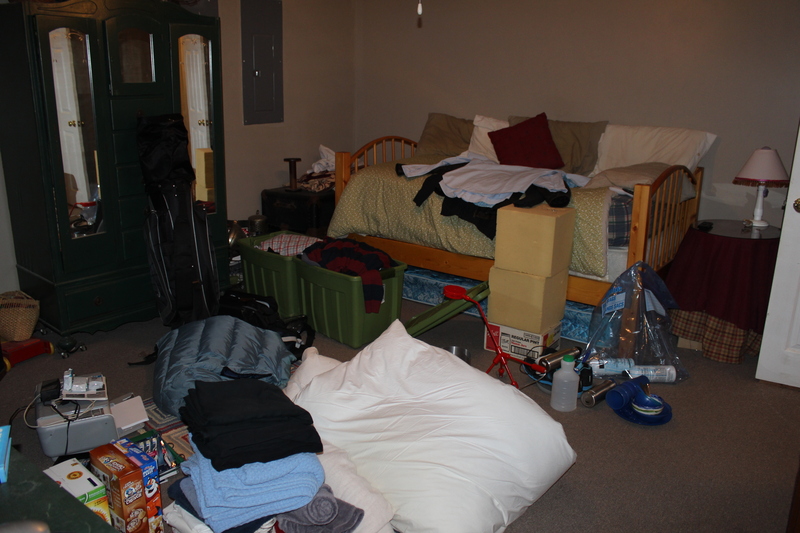 Although in other ways, I don’t have enough time – with everyone gone, much of the maintenance for the house and all the sorting and giving away of stuff is left to just me. I’m finding that life is a delicate balance between just trying to get through the day while recognizing that the day is pretty much as wonderful as it’s ever going to be. And I don’t mean that in a negative way. Someone once told me (in a church nursery no less!) that every age was the best age and the worst age. She meant it in terms of a child’s growth. If there’s a 4 month old baby that’s teething, obviously it’s the worst age because that baby is fussy; but it’s also the best time because that baby recognizes you and is soothed by you, and wants to just cuddle on your chest. Likewise, when you have a teenager, it can be the most God awful time as a parent because the teen is asserting his or her independence and wants nothing more than to pick a fight with you about anything and everything. But having a teen can also be an incredibly fun time because you actually get a glimpse into the person they will become. I’ve tried to recognize this throughout most of my kids’ lives, but I haven’t always been able to fully practice it without the busyness of life clouding my perceptions. However, her advice can really be applied to almost everything. Being newly married can be wonderful and awful at the same time. Becoming an empty nester, I’m finding carries with it particular joys alongside a distinct longing for the past. It’s all good, in a way. I just have to choose to find the good that’s surrounded by the mundane and the trivial and the losses. So when I say that each day is about as good as it will ever be, I mean that each and every day, when it’s spent with the people you love… well, what can be better than that?